Many preppers figure out pretty quickly that a pre-packed first aid kit is NOT a good thing to simply buy and throw in your bug out bag (BOB) to rely on. The reason for this is that many pre-packed first-aid kits contain cheap and low-quality items. You may think you’re getting a deal on that first aid kit with over 200 items in it, but chances are when you need those supplies they will fail you. So, the best way to prepare your first aid kits and yes, you’ll need to have several of them, is to find or buy your own containers and then purchase and pack your first aid supplies yourself a little at a time. By doing this, you know that the items you purchase and put into your first aid kit are the ones you are used to using. Packing your own first aid containers ensures you will have what your family needs in an emergency and reduces the chances of an allergic reaction, for example, we discovered that my daughter’s skin breaks out if we use generic band-aids which makes even minor scrapes even worse. Everything you put into your first aid kits should be high-quality, something you have used, or that you otherwise know will fit the medical needs of your family. When deciding on a container to hold your first aid kit, it’s good to understand the different levels of protection from the elements. Water resistant material is designed to repel water and dry quickly, so it doesn’t mold or mildew. Weather resistant containers are not meant to be submerged in water but will protect contents against water splashing onto them. These will hold up during a light rain for a brief period or the occasional splash of water. Water tight containers are designed to delay water getting into the container for a specific period or a very shallow depth. These are great protection against the occasional rainstorm or if accidentally dropped in a puddle or another shallow water source. Waterproof containers and pouches are designed to keep your items dry when submerged to a specific depth level. Make sure you know the limits of your waterproof container and make sure you test your container under the conditions you expect before depending on it in a survival situation. In most cases for containers to hold your first aid kit, water or weather resistant and water tight containers will be sufficient. Now that we’re clear on the types of protection from the elements we’re dealing with, here are our suggestions for 18 containers to hold your first aid kit. For the budget-conscious or those that want to organize their first aid kit the way that makes sense for them, zip lock bags are great. You can use a quart or sandwich-sized bags to hold like items together. For example, one quart-sized bag might hold all the items you would need to stitch up a small laceration, another bag might hold everything to deal with minor scrapes and splinters. And a third bag could hold everything to deal with gastrointestinal issues for example. Zip lock bags comes in sizes from very small (Snack size) to large gallon size bags. You can slide the zip lock bags loose into empty spaces in your BOB. Another way to organize these zip lock bags would be to attach one side of a Velcro strip to the back side of each zip lock bag and then attach the other side of the Velcro strips to a larger case or bag in the order you want them. Individual bags could be taken out of the case when needed and then put back quickly and easily. Hard-sided cases like these by Foxde Tech are ideal containers to hold your first aid kit. These are especially good for situations where there is a chance that supplies could be damaged or broken if bounced around. Use a hard-sided case, for example, to hold glass insulin bottles or other medication prone to being crushed or broken. A used Altoid tin is perfect for holding an individual first aid kit that you can slide into your pocket or drop into your purse. The large size is slightly smaller than a deck of cards and will hold band-aids, individual doses of OTC meds for pain, a sample packet of Neosporin, an alcohol wipe, maybe a needle and thread, and butterfly bandage or square of gauze. For those who prefer to keep their first aid supplies in a location that is easily accessible while on the go, waist pouches can be the perfect container to hold your first aid supplies. With a waist pouch, your first aid supplies are on hand without taking up valuable space in your BOB. When looking for containers that can hold your first aid kit, do not discount plastic Tupperware containers. These containers come with lids and can be found in all different shapes and sizes. They are air tight and keep contents secure even when jostled and bumped around which make them perfect for a DIY first aid kit container. These are less than $2.00 on Amazon plus shipping charge. I obtained them completely free at my local Giant Eagle grocery store by buying three first aid items made by Johnson and Johnson. I now have three of these bags, one that stays in the house, one that stays in the car, and one in my BOB. The coupon book inside each one is a huge money saver when you’re buying products to put in the bag. The bags are not waterproof, but they expand and will hold a LOT of items. My oldest one is three years old, and I’ve had no trouble with zippers breaking or anything like that. For those with a large family or group or who want to be prepared with supplies to handle injuries or illness for multiple people, consider multi-drawer plastic carts on wheels. These carts can be used to create a mobile first aid center that can be moved as needed to provide first aid treatment. Multi-drawer carts can also hold a larger quantity of supplies which will be needed when treating multiple people or a larger group during an emergency or SHTF situation. These mini-geocache tins are great for holding pills or other small items that you don’t want to get jumbled in with the rest of your kit. Several of these can fit into an Altoid tin and still leave room for some other items. You can write on them with a permanent market, so you always know what medication is inside each one. Lids may need to be tightened a bit, or you can use a hair tie or rubber band to keep the lid more secure. There are several different small backpacks available on the market today which can become a perfect container that can hold your first aid kit. When buying a backpack, make sure you check the quality of the stitching, durability and water resistance of the materials, and the quality of the zippers or other closures. These are especially good for short day trips where you want to have first aid supplies on hand, but you don’t need to carry an entire BOB. If you live in an area where rain is a frequent issue you will want to make sure you get a first aid kit that is at least water resistant. If you will be traveling through an area with lots of fresh water sources (creeks, rivers, ponds or lakes) where you could accidentally fall or drop your kit, and it could be submerged in water, then go for something waterproof such as the Scuba Choice Dry Case. Keeping your medical supplies dry and secure is crucial during a bug out. Rubbermaid has been making plastic tubs with tight-fitting lids in all shapes and sizes for many years. These make great containers that hold your first aid kit because they are lightweight and spacious. Determine the size you need based on the first aid supplies you need to carry. Use additional containers, like Ziplock bags, or Altoid tins, inside the bins to organize like supplies together for better organization. Molle style EMT pouches like the one by Condor in the link above are great for first aid kits. They attach easily to just about anything including your backpack, BOB, or even a bicycle seat. Available in red which makes it easy to distinguish from other molle packs for quick access. For the super budget-conscious, you can use an old tool box that you have lying around for your first aid kit. Metal ones are likely too heavy and burdensome but solidly constructed plastic tool boxes would work just fine. Use zip lock bags, Altoid tins, or mini-geocache tins to further separate and organize supplies within the tool box compartments. These handy little Zaptex first aid pouches come in a set of two. Several color choices mean that you could have a different color for each person in your family or group. These are small containers but are the perfect size for individual first aid kits to tuck in your purse, slide into an inside jacket pocket or an outside pocket in a backpack or overnight bag. The gray panel across the bottom would be a great place to write a name or initials with a permanent marker. Dad’s old tackle box can be put to use and become a perfect container to hold your first aid kit. Simply clean it out very well and then pack the least frequently used supplies into the bottom tray and the most frequently used supplies in the top tray. When you open the lid, all your supplies are there, organized in the compartment and easily within reach. The MTM Survivor Dry Box comes in two sizes and is designed to withstand extreme conditions. Because it is rugged, hard-sided, and water resistant, this is an ideal container to hold your first aid kit if you need to cache it somewhere along your bug out route as a back-up. In addition to storing backup first aid supplies, the MTM Survivor Dry box has a built-in compass and signaling mirror. It can be padlocked, and you can add a lanyard or shoulder strap as desired for carrying. Remember grandma’s big old purse, the one you used to tease her could hold everything but the kitchen sink? Well, head to the attic and dig it out because as long as it’s still sturdy, it can be used as a container to hold your first aid kit. If the purse doesn’t have enough compartments in it to keep things organized, you can use zip lock bags or mini geocache tins to keep small items separated. 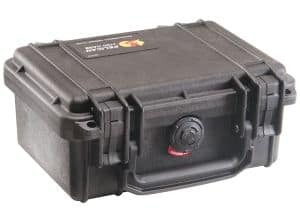 If you’re concerned about keeping your medical supplies protected during extreme weather conditions, try a pelican case. These cases are designed to protect expensive electronics, and they are watertight, dustproof, and crushproof. They come in a variety of sizes, and you can buy webbed organizers for the lid to add additional storage compartments. There are plenty of options out there for anyone who is looking to create their own first aid kit for everyday use, a bug out trip, or SHTF situation. It’s almost always better to make your first aid kit than to buy a pre-made kit. Regardless of the type of container to hold your first aid kit you choose, making the kit yourself allows you to customize your first aid kit with supplies that you know will be useful and reliable for your family or group. Dan, I am a prepper, former Marine (26 years) fighter pilot with 2 tours in Vietnam (one on the ground with 2/9), former Associate Dean of a major university, and mental health counselor/Life Coach with some 40 years of experience. Of all of the prepper information I currently receive, your prepper information is perhaps the most helpful. I want to encourage you to keep up the great work and service that you are providing. I forward your articles and tips to a network of folks less prepared than my wife and I. Bravo Zulu!!! I have to agree with Ron Clark. Dan, you are one of the best of the prepper resources on-line. Keep up the good work. And on to the topic. One of the things I have learned over the years is that the actual temperatures that items are exposed is only part of the environmental protection that needs to be addressed. In many cases, such as electronics, some dry goods, and definitely medical supplies, though they might stand a wide range of temperatures, the rate of the temperature change can be very important. First is rapid cool down. If there is any moisture in the container, it will often condense as the temperature drops rapidly. A slow decrease allows the moisture to remain in the air, rather than precipitate out as condensation. The other extreme is rapid heating. This can be the cause of a few things expanding a bit too quickly and occasionally damaging the packaging, though very well. The problem is mostly associated with liquids, creams, and other moist products. Rapid heating can lead to separation of components. High temps will, too, of course, but if you can slow the rate of heating it will help. For these reasons and several more, I have added insulated containers to my list of medical and first-aid suitable carriers. While the article list is excellent, consider using small to medium size insulated bags for some of the smaller soft kits. Also, there are some lunch bag type insulated carriers that have a hard insert. These can work for very light duty hard cases. Usually only the sides and bottom are hard. The top is usually soft, so there are limitations. For larger kits, especially those using modular packing, quality ice chests/coolers can be used as the main container. A plus with these is that they are usually very sturdy, many have wheels and a handle, and some have tie-downs and a method to lock them. They are also a good way to store extra supplies. Now, I do have to explain a couple more things. One is that even in an insulated container, even a good one, if the container is left exposed to extreme temperatures the inside will eventually reach the ambient outside temperature. The insulation slows the rate of temperature change. It does not stop it. But a slow change is better, in my opinion. And, even if exposed to extremes at times, but for limited amounts of time, the internal temperature will slowly change, but if the container is again brought into a normal temperature environment the internal temperature will return to that temperature. This means that you might have a cooler of medical supplies in the back of a pickup truck and travel for three hours in 110℉ and upon reaching the destination the cooler is put into the 72℉ home, where the temperature inside drops back down from the 80℉ or so it had reached to the 72℉ of the new ambient temperature. And it works the other way too. Moved from warm into very cold for a limited time and then back to warm the contents of the cooler will not have changed temperature much, and the change(s) would be slow. I would strongly suggest that insulated containers of several types be added to the choices in the article.